This playful and mind-bending introduction to modern physics briskly explains Einstein's general relativity, quantum mechanics, elementary particles, gravity, black holes, the complex architecture of the universe, and the role humans play in this weird and wonderful world. 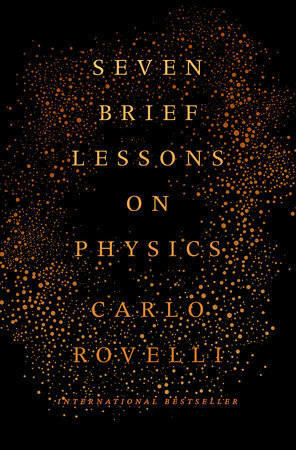 In clear, elegant prose, Rovelli guides the reader through a whirlwind tour of some of the biggest ideas in physics. His passion for his chosen field is evident on every page ... Seven Brief Lessons has a deeper philosophical bent — it’s a rare science book that cites Lucretius — and should appeal to readers with a similar sensibility. One can easily imagine perusing these essays while comfortably ensconced in an overstuffed chair by the fire, a snifter of cognac in hand. These are complex ideas, but Mr. Rovelli’s avowed mission is to convey the beauty of modern physics, if not its convoluted underbelly. Given the book’s brevity, peripheral topics whoosh by like signposts along a superhighway ... Reading praiseworthy books like [this], I find myself at once exhilarated by the indomitable spirit that propels our exploration of nature and oppressed by the countervailing backdrop of global disharmony. The essays in Seven Brief Lessons on Physics arrive like shots of espresso, which you can consume the way the Italians do, quickly and while standing up. As slim as a volume of poetry, Mr. Rovelli’s book also has that tantalizing quality that good books of poems have; it artfully hints at meanings beyond its immediate scope ... Mr. Rovelli imparts a sense that we may have begun to wave farewell, and his book is a roll call of the scientists who have taken us so far, from Einstein and Niels Bohr through Werner Heisenberg and Stephen Hawking. Like us and everything else in our universe, they emerged from one small, dense hot cloud. These men’s intellects simply burned a bit brighter. The lessons in Mr. Rovelli’s book, as elegiac as they are incisive, do them justice. What did you think of Seven Brief Lessons on Physics?